Actor Choi Woo Sik talked about working with After School's UEE! He sat down for an interview with Star News and said, "UEE noona doesn't have a boyfriend right now. I'm not in a relationship either, so I was happy that I'd be dating UEE noona in the drama. I dated her vicariously through my character in the drama. When else would I ever have the chance to date UEE noona? It wasn't actual dating, but personally, I was happy. UEE noona probably didn't like it too much, but I was satisfied." Choi Woo Sik also discussed why he showed so much affection for UEE during their 'Taxi' interview. He explained, "I don't know why I said that back then. I think it was because I was so focused on the drama. UEE noona helped me a lot. She even led the romantic scenes. I liked all the romantic scenes I had with UEE noona, like the kiss scene or the hug scene. I want to work with UEE noona again. If they ever make a season 2, only noona has to give her permission." It looks like Choi Woo Sik is really head over heels for UEE! Did you enjoy 'Hogu's Love'? After School's Jung Ah and 'Birth of a Great Star's Han Dong Geun will be getting together for a duet song! Pledis Entertainment announced that Jung Ah and Han Dong Geun would be collaborating for the first duet project from the label. The agency stated on April 7, "Jung Ah and Han Dong Geun will be release 'Between the Two of Us' on the 16th. This is just one installment of Pledis Entertainment's duet project series this year." "Between the Two of Us", a ballad song, is also Han Dong Geun's very first self-composed track. Stay tuned! Are you excited? 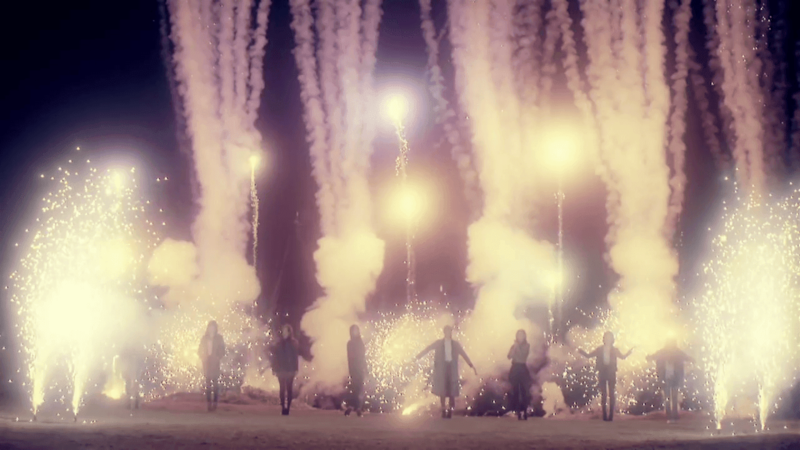 The Japanese PV for After School's "Shine" was uploaded onto YouTube, showing all girls looking refreshing, charming, and absolutely stunning as they compete with the bright sparklers and lights in the MV. Another eye-catching part of the video is the clear participation of member Jooyeon, who had graduated from the group back in December and has since joined 'Better ENT' as an actress. The song itself is super sweet and the girls show off their camaraderie as they laugh with one another and hang their arms around one another's shoulders. They declare with strength that they will "shine like a flower." You can read the full lyrics as English subs are provided. After School's Nana will be talking about her ideal type and past relationships on the upcoming episode of SBS' 'Roommate'! celebrity? ", the conversation got even more interesting. While listening to Lee Kuk Ju and Sunny's stories about their love lives when she revealed her ideal type, saying, "I like a guy with a lot of aegyo." When talking about the gifts they received while dating, Nana shared, "A handmade photobook left the greatest impression on me." Lee Kuk Ju asked in response, "Was he a celebrity? ", leaving Nana slightly taken aback by the forward question. With Nana being in the headlines lately for her rumored relationship with Hong Jong Hyun, viewers will undoubtedly be interested in hearing what she has to say when the new episode airs later today at 11:15 PM KST! Idol-turned-actress Jooyeon got teary-eyed at her After School graduation and fan club event. Japanese media outlet Sankei Sports reported on March 24, "Jooyeon, who left her team to follow an acting career, shed tears at the fan club event held at the Negishi Tokyo Cinema in Tokyo on the 20th." The event was held in part to celebrate After School's first best-of album in Japan, and Jooyeon also received her graduation diploma from the group. Twelve hundred fans gathered to give their support and say goodbye to Jooyeon. She said at the event, "I'm happy I got to meet you all today too. This is my last time as a part of After School. I'm very sad, but I'll show you a better side of myself in the future. I'll work hard as an actress from now on. Thank you so much. I wanted to end it with a smile, but I'm so overwhelmed, my tears came out. I won't be able to stand on stage with my members anymore, but if a good opportunity arises, I hope we get together." Member Nana consoled her, saying, "We won't be apart forever, so don't be too sad," whileJung Ah said, "It's been 7 years since I met Jooyeon since the trainee days. I trust that she'll succeed as an actress, and I'll support her quietly from afar." After School's Nana addressed her dating rumors with model-actor Hong Jong Hyunon the March 3rd episode of 'Roommate'. Jo Se Ho mentioned, "There are a lot of people who want to see Nana and Sunny around me. They can't see Nana anymore though," referring to her reportedly being taken by Hong Jong Hyun. Sunny responded, "Explain yourself, so you feel refreshed." Nana said, "He's just a friend. We're really close. I even told Sunny unni that we were close." The Girls' Generation member added, "When I saw the headlines, I thought, 'How can this be, my Nana?'" Jo Se Ho, who's known to have a big crush on Nana on the reality show, then said, "You must've acted in a way that caused a misunderstanding." Nana explained, "I think it's because we're close. We didn't even see each other alone. We were with other friends." After School's Uee will be making her much-awaited return to television in tvN's upcoming drama A Pushover's Love. To promote the drama, the acting idol and her fellow cast members participated in a celebratory photoshoot for @Star1's February issue. 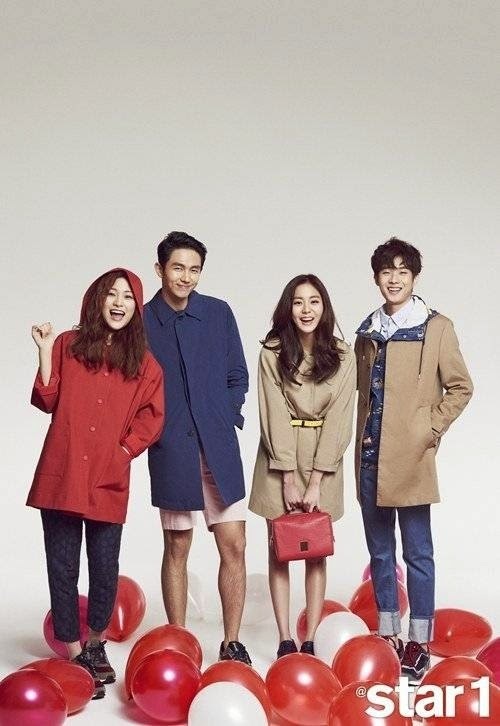 Uee, 2AM's Seulong, Choi Woo Sik, and Lee So Kyung looked like old school friends while modeling in the light gray set. The group posed within waves of colorful confetti and huddled together while surrounded by red and white balloons. The women wore raincoats, lace blouses, jeans and round-tip heels. The men wore casual shorts, blouson coats, jeans and sneakers. One of the standout wardrobe pieces was UEE's Lucky Chouette shirt, which resembled expensive leather. The piece is called the Lace Blouse Top and can be yours for $210 at the brand's official online store. In the accompanying interview, UEE discussed her ideal type. She revealed, "Before, I used to like masculine men who could protect and hold me, but I changed a lot as I got older. I like nice men better now. Instead of just being protected, I now like types that I can hug. Even if it's frustrating sometimes, I want to date someone nice." A Pushover's Romance is based on the webtoon Fool's Love by Yoo Hyun Sook, the same writer of the Flower Boys Next Door webtoon. Pyo Min Soo, the director of Full House, Iris 2 and Heartstrings, will head the drama. Meanwhile, Yoon Nam Joong, who wrote the KBS drama God of the Workplace, is the screenwriter. With such an amazing cast and production team, expectations are high for the drama. 130320 How does After School’s UEE maintain her ‘honey thighs’? 140714 Find out Nana’s real weight on ‘Roommate’!